Black-hole-powered galaxies called blazars have powerful jets that are thought to be fortuitously aimed directly toward Earth. Blazars emit at wavelengths from the radio to the gamma-rays, but astronomers have now found two objects that are blazar like in many ways but which are radio-quiet. Using the Fermi catalog of very high energy sources and the WISE infrared sky catalog, astronomers have found two BL Lac blazars with no apparent radio emission: “radio weak” BL Lacs. A blazar is a galaxy whose central nucleus is bright at wavelengths from the low energy radio band to high energy gamma rays (each gamma ray photon is over a hundred million times more energetic than the X-rays seen by the Chandra X-ray Observatory). Astronomers think that the blazar nucleus contains a supermassive black hole, similar to a quasar nucleus. The emission results when matter falls onto the vicinity of the black hole and erupts into powerful, narrow jets of radiating charged particles moving close to the speed of light. Two defining characteristics of blazars, strong radio emission and high variability, are results of the accretion and jets. Although the nuclei of other galaxies also eject jets of particles, the class of blazars is thought to result from our unique viewing angle: staring directly down the throats of these jets. The orientation makes these objects unique probes of exotic physical activity, with the relative intensities of the radiation providing key diagnostics. In most other galaxies, for example, infrared radiation comes from heated dust, but in blazars the infrared colors indicate that it comes from jet emission. Because the jet emission is so bright the underlying galaxy light can be masked, with the result that in the class of BL Lac blazars emission and absorption lines are not detected, making their distances difficult to determine. CfA astronomers Raffaele D’Abrusco and Howard Smith and their four colleagues report discovering blazars that challenge this general paradigm. They found two BL Lac blazars with no apparent radio emission: “radio weak” BL Lacs. The astronomers discovered them by using the Fermi catalog of very high energy sources to identify a set of possible new blazars, and the WISE infrared sky catalog to reinforce the categorization and to pinpoint the locations of the sources in the sky. After searching radio catalogs for counterparts to the sources, they discovered two that had no detected radio emission. 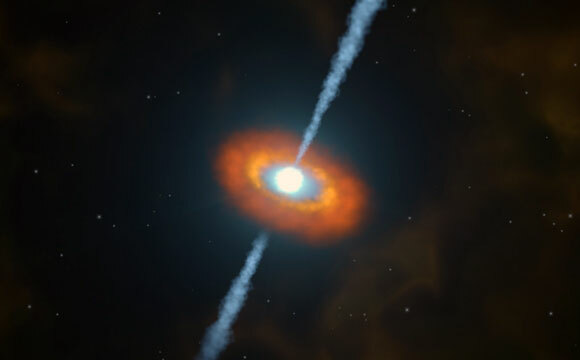 Since blazars are by definition highly variable, and since not all of the wavelengths were measured at the same time, the scientists review the possibility that the emission at one or more wavelengths varied enough to account for the peculiar observations; they also examine some other possibilities. In the end, they conclude that although variability might be a possible explanation, if these candidates behaved like other blazars, variability alone could not resolve the mystery of the radio silence. If confirmed, these new Radio Weak BL Lac objects challenge the basic explanation of blazars. How many radio weak BL Lacs exist, how far away they are, and how they are formed and evolve – indeed why they exist at all – are now pressing questions in extragalactic astronomy. Reference: “Radio-weak BL Lac Objects in the Fermi Era,” F. Massaro, E. J. Marchesini, R. D’Abrusco, N. Masetti, I. Andruchow & Howard A. Smith, ApJ 834, 113, 2017. 1 Comment on "Radio Weak Blazars Challenge the Basic Explanation of Blazars"